On a cool, fall day last week, there was a heavenly aroma permeating my humble kitchen. The scent of apples and cinnamon hovered in the air for awhile even after the oven was turned off. I had just made my favorite Apple Cake, a recipe given to me by my Mother-in-law when my husband and I were first married. This moist, cinnamony cake is a favorite in our family (except for those who don't like nuts), and I always look forward to making it- and eating it! As I was eating my first piece of this luscious cake, I began wondering about the history of apples in America. Why? I don't know. I mean, I remember reading about Johnny Appleseed in school, but was there more? So I did a quick google search and found an interesting article at What's Cooking America, called, "History and Legends of Apples",written by Linda Stradley. She has done some research on this delicious fruit which was so interesting to read. Actually, the first apple seeds to arrive in America were in the 17th century! One of the first instances was when William Blackstone arrived in Massachusetts from Europe in 1623. He carried a bag of apple seeds with him and planted an orchard on Beacon hill in Boston, among other places. The early settlers even had to import honey bees! Anyway, by 1640 nearly all landowners had planted apple trees. According to her article, there are over 7000 varieties of apples in the U.S.! Amazing! If you like history, check out this site. Now, let's get to this delicious recipe so you can make it! In a large bowl, mix the apples and sugar together. In a separate bowl, mix the flour, baking soda, salt, cinnamon and nuts together. I know this sounds strange, but trust me. I've been making this for years and this is the easiest way. Stir the apples; the sugar will be liquefying by now. To the apples and sugar, add the eggs, oil and vanilla and mix well. This is a very thick dough that is loaded with apples. If you noticed, there isn't a lot of liquid in this cake. Most of the moistness comes from the apples. Spoon batter into a greased and floured 9x13 inch pan. Place in a preheated 350 degree oven and bake for about 1 hour. Test with a toothpick for doneness. Cool completely before serving. This is best made early in the day you are planning on serving it. This cake needs a few hours to develop its moistness. The original recipe called for 2 tablespoons of vanilla! As you noticed, I've cut it down to 2 tsp. which is enough. The day of baking, the cake will be crusty on top, but as the day wears on the cake develops its moistness from the apples. Each day, this Apple Cake gets more moist. 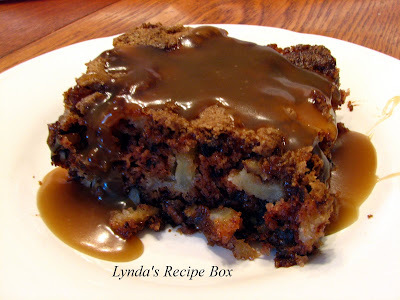 This is more a snack cake, but I like to make Caramel Sauce to drizzle over the top to dress it up some. Now that is a decadent touch! I guess you can tell from the pictures that I got carried away with the caramel. But it was sooo good! I'll give you the Caramel Sauce recipe my next post. Have a great weekend! The best Apple Cake I have ever seen!!!! Apples + Caramel = Heaven! I don't think you got carried away at all! Oh my, with that caramel topping, I just want to reach in through the screen and take a huge bite. I love, love apple cakes and am always on the look out for the best. Well, my dear friend, this looks outstanding. Will be adding this to my must-make stash and as apples are just coming into harvest, will be baking and loving this one soon!! I would love this. Taking my children apple picking today.. maybe we'll make this when we come home. Lovely! WOW, look at the caramel...makes me drooling.. I have a bag of apples on the countertop and was wondering what to make. Now I know! It sounds wonderful! What a lovely old-fashioned recipe. I can't wait to try this. Have a great day. Lynda... From your photograph, I can almost smell the aroma of this awesome cake baking. What a wonderful recipe your mother-in-law handed down... and now you pass it on to us. Many thanks and I can't wait to try it! Oooh, I LOVE fruit desserts! That looks amazing. 7000 APPLES??? wow..who knew. I have probably had 5 or 6 of those. Hmm I feel cheated!!! From the photo, I believe you when you say it's the best ever. A must try. This does look delicious. I thought from the photo that it was chocolate cake with apples. I wonder how these would be as a muffin? What an outstanding cake. It truly is drool worthy. That is one decadent cake! And the caramel just puts it over the top. Goodness gracious it is just mouth watering. My mom makes an apple cake a similar way, but without caramel and I think that caramel should definitely be mandatory - looks so good! that looks sooo moist and delicious. your caramel looks scrumptious! I enjoyed reading your findings on apple history in the US. I too often take for granted all the effort made to build this country. Your cake looks like a slice of fall right on the page! I make something very similar, but with a caramel frosting instead of caramel sauce. I look forward to seeing your sauce recipe so I can try a new variation. You have to love this cake, you just have to! A friend of mine just went apple picking and was looking for recipes..I sent her this one! yum! I've been itching to take the kids apple picking and I can assure you that this recipe will be utilized when we finally do get around to making the trip! Yes looks far to delicious! I will alter a tad, I am a big butter fan. Lynda - I wanted to let you know that I made this cake today. I changed a few ingredients and made a few healthy substitutions but the recipe was basically the same. It came out AMAZING! I made it especially for my friend Jess who's coming in to visit me from PA tomorrow. She loves apples and caramel so I know she will love it. thanks so much! I'm going to share my alterations on my food blog one day next week with my readers! Keep up the great work! Mandy- I'm so glad you liked this cake; it remains my husbands all time favorite. I'll be looking forward to your post so I can see the changes you made to make it your own. Thanks for the comment! 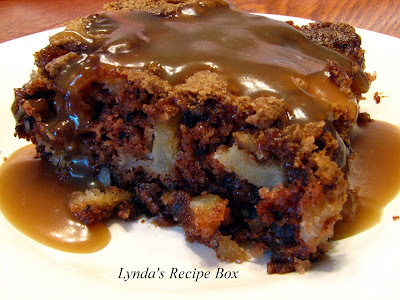 Lynda..my mother in law and I have both been making this exact same recipe for years. Mine turns out light in color, her's turns out dark, like yours. Can't figure out what I am doing different?? Jackie, I don't know the answer to your question, but I have wondered about other recipes I've seen and they aren't as dark. My MIL's was dark too. As long as it's moist and tastes good, don't worry about it! Maybe there's some scientific answer??? Thanks so much for the question- but sorry I don't know the answer. Have You ever poured the Whole recipe of Caramel Sauce over Cake while it's hot? I just tried it:)We'll see? anonymous- I have not tried that, although I have thought about it. I have seen apple cake recipes with caramel icing, but not sauce. Well, the cake is in the oven. I used cooking margarine instead of oil. If the dough taste's good the cake normally does to. My 16 year old daughter could not keep her fingers away from the dough. Will let you know the outcome. which apples do you think would be best for this cake, I like granny smith, but my family prefers red delish..... any thoughts, or is there a better one? Baked Macaroni and Cheese- Perfect Comfort Food!